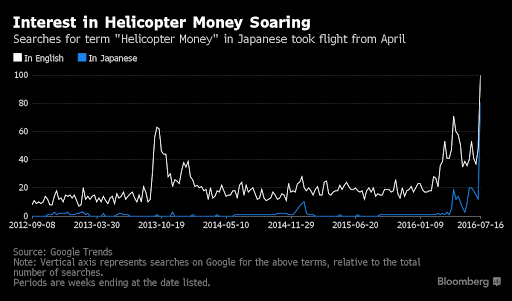 Home > Japan > Who's the First with Helicopter Money? Who's the First with Helicopter Money? Welcome to this week’s edition of “World Out Of Whack” where every Wednesday we take time out of our day to laugh, poke fun at, and present to you absurdity in global financial markets in all it’s glorious insanity. It used to be that the Japanese were known for being nauseatingly polite, eating whales and dolphins for breakfast, lunch, and dinner, while living in tiny homes made from paper and working themselves to death in office cubicles. But all that has sadly changed. Today you can’t mention Japan without simultaneously mentioning debt – they’ve become synonymous. I’m very fond of Japan, mostly because it’s been very profitable for us. Long-term readers will know we’ve been discussing Japanese debt and the yen for years, beginning with a satirical piece I wrote back in January of 2012, pointing out what seemed like a pretty decent risk-reward trade. Playing the channel has since been fun. Before you undeservedly mistake me for being a genius, let me point out that we’ve also been extremely lucky. You see, the only reason we’ve not shorted Japanese sovereign debt is because the only real way to do so is OTC with a $100 million balance sheet and the ability to drop $10 million into buying credit default swaps. Sadly that’s a big stretch and so the yen has been our favoured trade. Turns out the bonds have simply gone higher while the yen has gone much lower. Lucky for us! Not being able to play in the sandpit with the big boys has worked out for us thus far, though at some point even the destruction wrought by Fukushima will pale into comparison to what happens when Japan inevitably succumbs to fiscal gravity. But before we get there it seems that we may have one more act in this particular show. You see that intellectual idealistic do-gooder clown Ben Bernanke recently visited with BOJ’s Haruhiko Kuroda and Japan PM Abe to discuss helicopter money. This term – helicopter money – is unbefitting for such “fine intellectuals” and so it’s wise to conjure up a more “suitable” name. These bonds are, ahem… perpetual. Which begs the question as to what the yield on these strange instruments we could expect? Now in order to take the already absurd and turn it into the completely nuts why not issue a perpetual bond at zero coupon? In fact why issue a bond at all? Why not simply deposit money into citizens’ bank accounts directly and do away with the charade? I’ll come to that in a minute. But I bring all this to your attention today since it’s Wednesday, 27th of July and in 2 days time, on the 29th of July, the lunatics at the wheel of HMS Japan may well be ready to begin the final act in this experiment. “Etsuro Honda, who has emerged as a matchmaker for Abe in corralling foreign economic experts to offer policy guidance, said that during an hour-long discussion with Bernanke in April the former Federal Reserve chief warned there was a risk Japan at any time could return to deflation. He noted that helicopter money — in which the government issues non-marketable perpetual bonds with no maturity date and the Bank of Japan directly buys them — could work as the strongest tool to overcome deflation, according to Honda. Bernanke noted it was an option, he said. When you think about it Japan already has negative yields all the way out to 15 years at present which is absurd enough already. And so moving to a perpetual zero coupon bond isn’t actually that big of a leap at this point. There is a key difference though that I want to make. With a negative yielding bond there is a promise for the bond holder to actually receive their cash back at the end of the term. What then does a perpetual bond look like? What!? You don’t ever get to be repaid your cash? What do you do? Gift it to your kids who gift it to their kids? I just don’t see how any of this can actually work. Now if I was to put myself in the shoes of Kuroda-san what would make sense in a warped sort of way is to use the BOJ to buy up all the existing bonds, and then as owner of those bonds convert them all to perpetual zero coupon bonds. In a chat I had with Raoul Pal the other day, Raoul suggested that a debt jubilee would have serious implications for the derivatives market which uses them as collateral. Wipe it out and the entire derivatives market can’t price. Well, by shifting existing bonds to perpetual bonds doesn’t strictly speaking wipe them out. But issuing them as zero coupon would still seriously affect pricing of the collateral and thus the entire derivatives daisy chain. Thankfully these visionary luminaries such as Bernanke, Krugman, and Kuroda have thought all of these issues through and wouldn’t do anything remotely reckless so there’s little to worry about and we can move right along to find a Pokemon creature. With every new stimulus plan initiated, the market continues to expect ever more, creating a perpetual cycle. 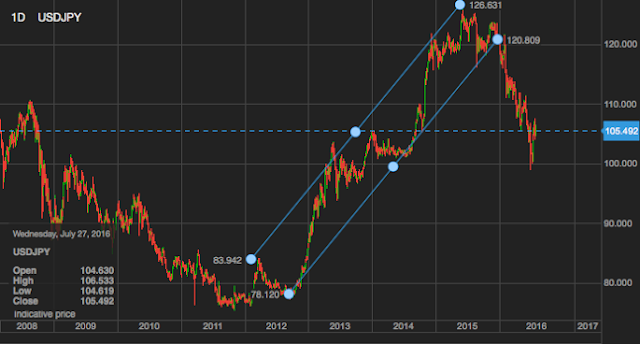 For Kuroda this must be truly awful since no matter how large his plan or how big the bazooka he brings out it simply means that the next bazooka needs to be even bigger as the market keeps anticipating more and more. The shock value is no longer what it used to be and what we’re getting now (and must be the source of many nightmares for central bankers) is that market reactions to their “shock policies” are turning negative. We saw this when Kuroda instituted NIRP and the Nikkei dropped 900 points and the yen rallied. Hardly what he had in mind. 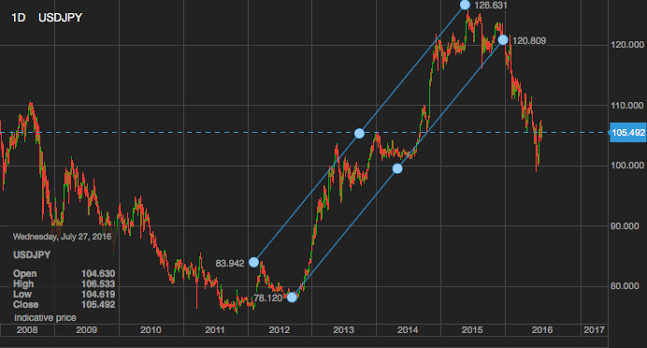 Is it too much of a stretch to think that Kuroda doesn’t want to see that again, and since there is no turning back from the path already taken, helicopter money it shall be? The below is from Bloomberg who used keyword trends from Google. It is clear that market participants are asking themselves the same question. Come Friday we’ll find out what the BOJ’s “the new plan” looks like. The question therefore is this: is Japan gearing up to be the guinea pig for central bank policy in the US and Europe? Perpetual bonds and helicopter money are insane but hey, show me what our current state of monetary system isn’t?